Gulu. President Museveni has directed the Uganda People’s Defence Forces commander Gen David Muhoozi to evict the Balaalo pastoralists from northern Uganda following claims from the locals that the pastoralists’ animals are destroying their crops. The directive follows a meeting between the President and Acholi Parliamentary Group at State House in Entebbe last week. President Museveni directed Gen Muhoozi to evict all the Balaalo pastoralists rearing their animals on unfenced land, urging that pastoralists are not supposed to move anyhow on people land. Hon Okumu Reagan, member of APG and MP for Aswa County in Gulu District, said what remains is to follow up the directive and ensure that it is implemented. Between September 2015 and August 2016, local leaders hailing from Gulu, Amuru and Nwoya districts had issued an ultimatum ordering the pastoralists to evacuate the districts on ground that some them (pastoralists) possessed guns and were threatening the lives of indigenous farmers. Patrick Okello Oryema, Nwoya District chairman, said the directive will ensure the Balaalo leave the district because most of them are herding their cattle in the area illegally. “It is a good directive since the issue of the Balaalo has become a national concern,” he said. Mr Oryema cited Anaka, Got Apwoyo and Lungulu sub-counties as the most affected. 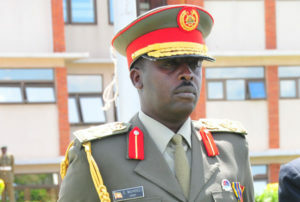 CDF Gen David Muhoozi set to oversee the President’s directive. Courtesy photo. Ojara Martin Mapenduzi, Gulu District chairman, appreciated the President’s directive, urging that Balaalo are very disrespectful because the graze their animals on people’s crops. The meeting also discussed other issues including President Museveni’s promise to protect the people of Apaa and bring to book the culprits who carried out the heinous attack that left a total of 11 people dead. The President also promised to respond other emergencies in the sub region, including Nodding disease syndrome, hunger due to prolong drought as well as the issue of refugees in Lamwo District. President Museveni also directed the Minister of Agriculture to ensure that the Aswa ranch is restocked to benefit the people in the sub-region.